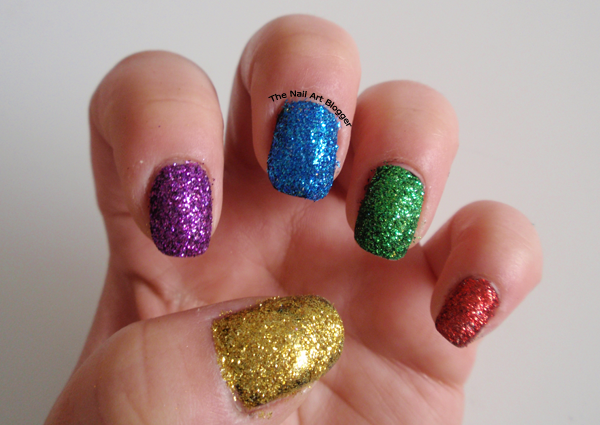 The Nail Art Blogger: Glitters. A lot of glitters. Glitters. A lot of glitters. I'm back! A little explanation of why I haven't been posting for so long. I had exams, and I needed to fully concentrate on them. So my blog and everything nice had to be put on hold for a while. And after the exams I got busy with life, and my cuticles were in a horrible shape because I ran out of Lemony Flutter! But now I'm here, my cuticles are healthy again because I have a new pot of Lemony Flutter and I'm using it on a daily basis. Still don't have the results to my exams, but there's nothing I can do about that other than waiting. Now, onto the nail art. One day I was bored and decided to play around with the pot of glitters that I bought. Let me tell you one thing: glitters are MESSY! But also fun, if you don't mind having your whole apartment be glittery for weeks. I didn't make many good photos of this one, but here's the best one I could capture. I used the 144 black is back from Essence for base, which wasn't a good choice for the golden glitters, but it turned out alright. And in the end I used a top coat to keep the glitters in place. Thankfully it didn't make the glitters bleed or anything of the sort.